Designed to maintain safety and integrity. The InBrella System was designed to maintain the safety and integrity of the work area under a drop ceiling and acoustic panel by capturing water and redirecting to an area you select. Protect employees, customers and equipment from a ceiling leak. 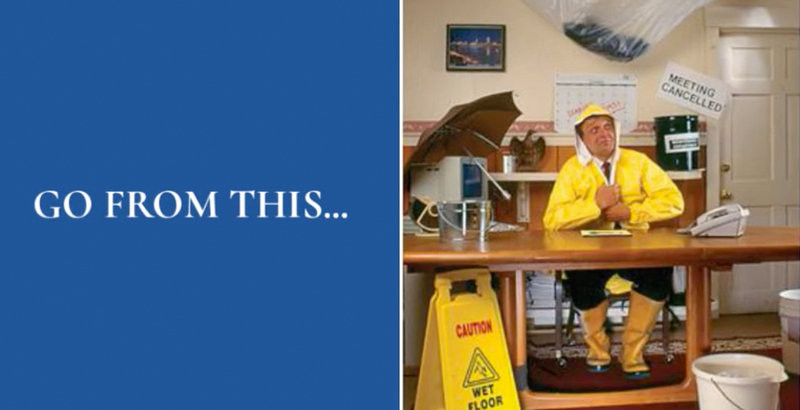 Eliminate slippery wet floor conditions, plastic sheets, hanging buckets, and wet ceiling marks with InBrella. Our patented panel is part of a completely reusable kit. It comes with all the components necessary to redirect a water leak up to 25 feet away. This system diverts water for days or months when maintenance cannot immediately repair a leaking pipe, drain or roof. Are you a maintenance and facilities distributor or supplier? Contact us today to add the InBrella System to your catalog. Remove the acoustic ceiling panel where the leak has been found, and easily insert the 2x2 or 2x4 InBrella ceiling panel. Attach your drain hose to the InBrella System's drain nozzle, and attach the supplied clips to your ceiling rails. Thread your plastic cable tie through the loop and the attached clip, and securely fasten your drain hose. Your leak will now drain to the center of the InBrella System panel, and out through the drain hose. Now you can redirect your drain hose as far as 25 feet away.